January is finally over and it legit felt like the longest month of my life. My favourites for January was actually hard to narrow down as I wasn't sure if I was just liking some of the products or loving them because I was trying out so many new products from Christmas. Anyways I narrowed it down to nine assorted products/things. Breville Blend Active: I'm not one to eat fruit, you would never really see me with an apple in my hand unless I was forcing myself to eat it. However I love smoothies so getting this for Christmas was a great thing! Now because of this I know I'm getting fruit into my diet and it's somewhat healthy!? Well about 5% of it anyways. I may have also made the odd cheeky oreo milkshake using this and it's too die for, but we'll pretend that never happened. Origins Drink Up Intensive Mask: When I got the Origins Mask Marvels this mask was the one I most excited to try out (read more about it here). I found that it really helps my skin when it may be dry and just need a pick me up. It also leaves my skin feeling so unbelievably soft when you wake up in the morning. I will more than likely buy this in full size when I run out as I really do love it and feel like it does so much good for my skin. 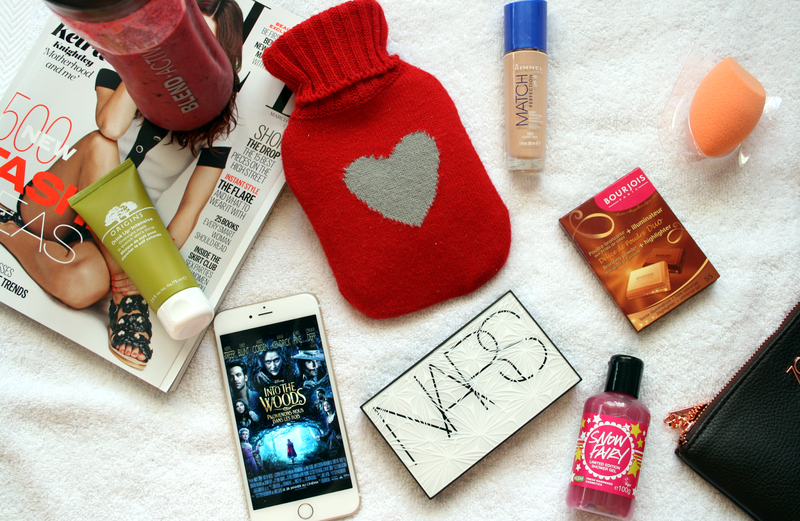 Hot Water Bottle: How have I lived without one of these little magical things. I was constantly saying how much I wanted a water bottle and for Christmas my brother got me a mini sized one in a hot chocolate and mug set. I have used this so much as it's still a bit chilly it's so lovely for when you are lounging around or going to bed for some extra warmth. I also love how it has a little heart jumper on it, it's just so cute. Into The Woods Movie and Soundtrack: I adore musicals so when Disney released Into The Woods I was beyond excited and had to see it straight away. I think I've seen it about 4/5 times now and I absolutely adore it. Adoring the film meant that I needed to get the soundtrack and honestly it's been on repeat ever since so much so that it annoys everyone in the house. Nars Laguna Bronzer: After listening to the hype about this product for so long I can officially say I now understand why. I have been reaching for this so much since getting it as I love how buildable it is and it just gives such a gorgeous sun kissed glow to the skin. I did do a post all about it which you can find here incase you missed it! Rimmel Match Perfection Foundation: After using cream foundations for probably more than half a year I've finally gotten back into liquid foundations and have been loving my old holy grail foundation. I'm currently using it in shade 101 as I'm not really bothered about tan right now considering it's still cold and randomly snows every few days. I just adore the coverage this foundation gives me. Real Techniques Complexion Sponge: The reason I've gotten back into liquid foundations is because of this little gem. Honestly I never thought I'd be using a sponge to apply any makeup let alone all 3 of my base products. This just applies your foundation perfectly and because of the shape of it, it allows you to get around your nose and under your eyes without any problem. I did a full post on this because I couldn't not write about it! Find it here if you've missed it. Bourjois Delice de Poudre Bronzing Powder: Giving my Sleek bronze block a break over January to try out other products and I have to say I've fallen back in love with this bronzer. I just adore how it looks on my skin. It's not to light or dark and with one sweep of my brush it's the perfect shade. It also looks like chocolate and if that doesn't make you love a product then what will?! Lush Snow Fairy Shower Gel: The ever so famous Snow Fairy. This was actually my first time trying this product and yes I agree with the hype. It smells amazing and leaves your bathroom smelling like candy floss. It also has little bits of glitter in the shower gel which I think is just such a nice touch. I do wish I had bought a bigger bottle of it and now I somehow need to make this last until December. i loooove the bourjois bronzer but i haven't tried the one with the highlighter included, i really want to though! and i love the rimmel match perfection foundation - nice picks!! ooh love the laguna bronzer, new packaging though? Snow Fairy is ridiculously yummy!